*This section details the configuration process involved in the revenue recognition. 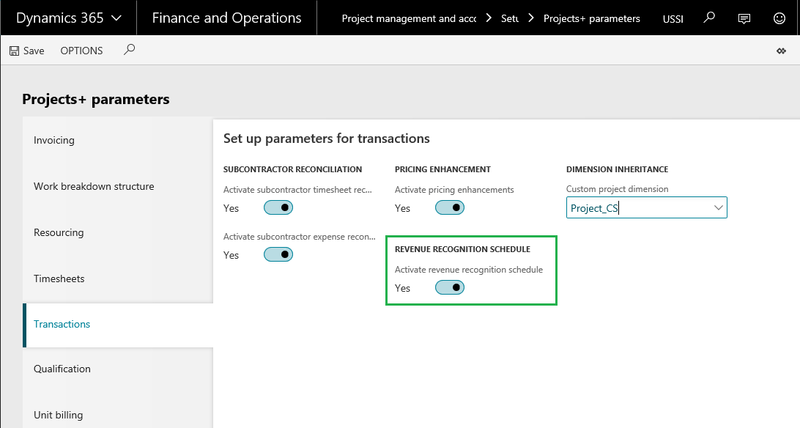 To activate the revenue recognition feature set the ‘revenue recognition schedule’ option to Yes. Revenue Period is created to define the number of periods the user would like to defer the revenue received. The deferment schedule is attached to a fee journal for deferring the revenue received. 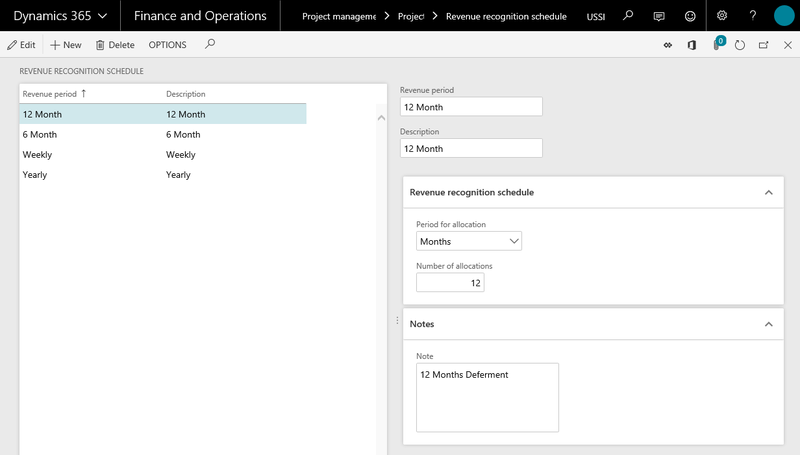 New Click to create new deferred revenue ID. Delete Click to delete existing revenue period. Revenue Period Specify an identification of revenue recognition which will be used as the reference. Description Specify a description of the revenue period. 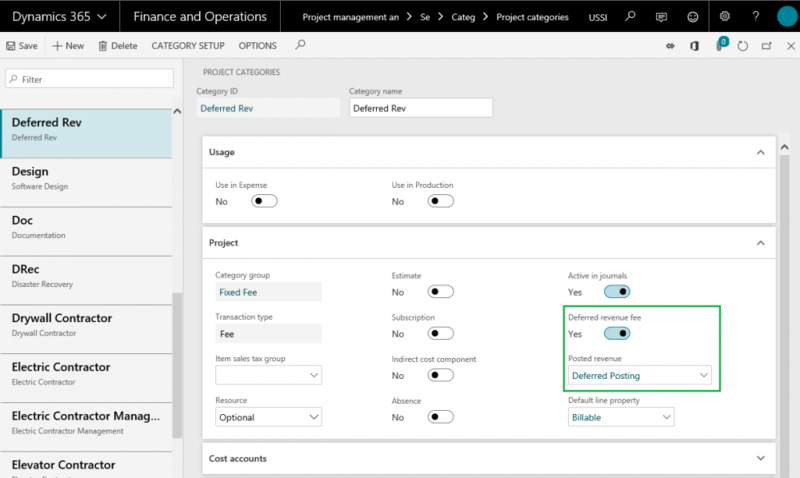 Period for allocation Select the period for allocation. This defines installment is to be distributed in terms of weeks, months or years. Number of allocations Enter the number of periods for which the deferment is desired. Notes Specify a brief description or note for the revenue recognition. The revenue that is received is deferred over a period of time and when the actual revenue is posted per month, it is known as the deferred revenue reversal. For such a journal the number sequence has to be set up in the project management and accounting parameters form. Revenue recognition reversal reference is added to the project management number sequence as soon as the user activates the Deferred revenue – Activate deferred revenue fee. Select the number sequence code for the reference – Deferred revenue reversal. 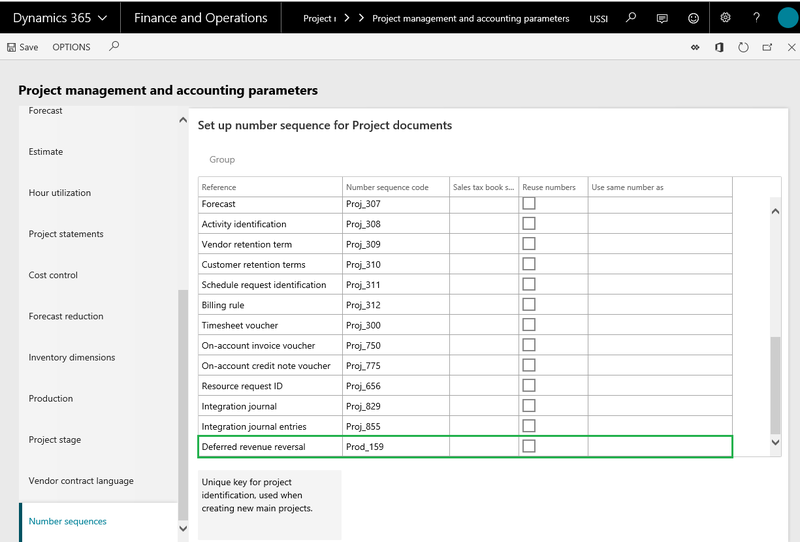 On the Project categories form choose a fee category to set it as a deferred revenue category. Mark the option Deferred revenue fee to ‘Yes’. Note the the deferred revenue fee checkbox will be available for only fee type of category group and not to the hour, expense and item type of category groups. Once this option is set to ‘Yes’, the Posted revenue field is enabled and becomes a mandatory field. This field will allow the users to select another fee category which will be used to actual booking of revenue upon the deferment posting. 1. On invoicing the fee journal, the below entry would be generated as per standard. 2. When posting the deferment, the below entry would be generated.